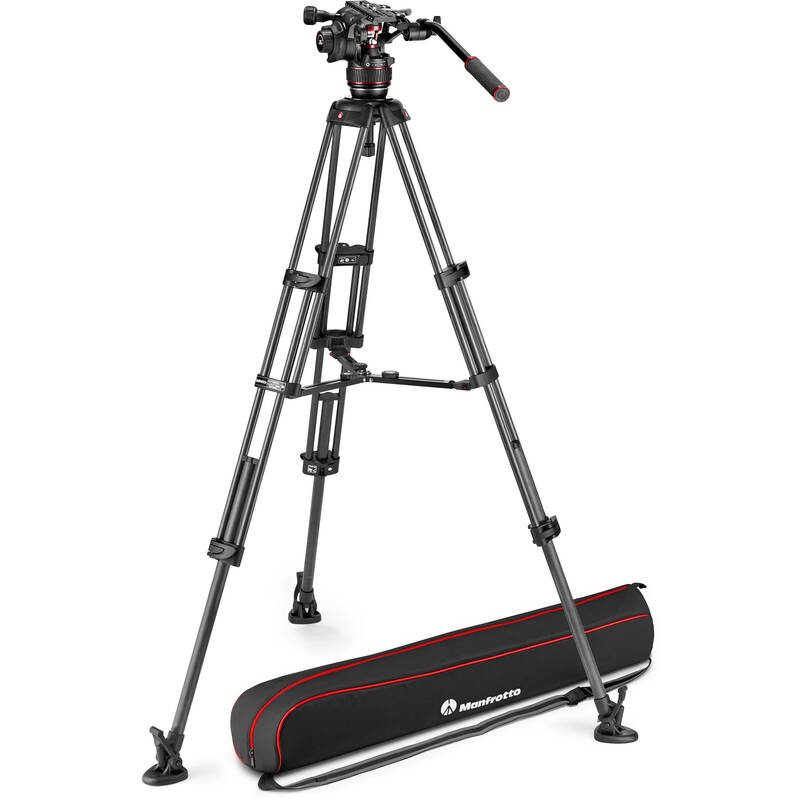 The 608 Nitrotech Head and Carbon Fiber Twin Leg Tripod with Middle Spreader from Manfrotto provide content creators with a versatile solution for various applications. A compact head is paired with a lightweight three-section tripod and removable middle spreader that allows for added stability and more accurate angle adjustment. The head supports up to 17.6 lb and features a Nitrogen gas piston mechanism that allows for continuous counterbalance across the full payload range. It's also designed with improved fluid technology that allows smooth and judder-free pan and tilt movements. Other key features of the head include a side lock camera plate system and two rosette adapters each with a 3/8"-16 accessory port and Manfrotto and ARRI anti-rotation slots. The Manfrotto Carbon Fiber Twin Leg Video Tripod Legs with Mid-Level Spreader is suitable for use on flat, smooth surfaces as well as uneven terrain, and it features carbon fiber tubes that are both strong and lightweight while being corrosion resistant. The legs incorporate a 100mm half bowl and include a 75mm adapter ring, so you can use them with heads that have either a 100 or 75mm half ball. The legs support up to 44.1 pounds, which allows you to mount an appropriately sized fluid head, camera, and accessories without straining the capacity of the legs. With the included mid-level spreader attached the height of the legs can be adjusted from just under 2 to over 5 feet high, and the legs collapse to under 28 inches in length for transport and storage. Removing the included rubber feet reveals the dual spiked feet, which are useful for soft surfaces such as gravel, dirt, or sand. The legs weigh a mere 6.61 pounds, making them easy to take almost anywhere you can go. The integrated lever locks are strong, durable, and increase the torsional stability of the legs. The included adapter ring is removable and attaches with three mounting screws. Attaching the adapter converts the 100mm bowl into a 75mm bowl. The removable mid-level spreader enables using the legs on uneven terrain, and can be used to stabilize the legs on uneven surfaces such as stairs.